Do houseboats need a marine refrigerator, won't a regular fridge work on house boats? What's best, a regular fridge, or a marine refrigerator? I'm new to house boats, but wondering why a marine refrigerator is so expensive on houseboats? 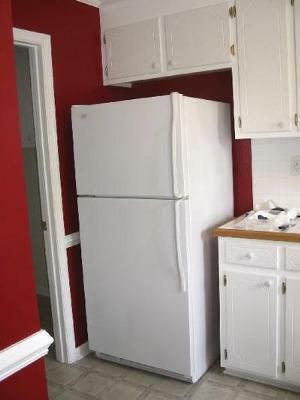 Won't a regular fridge work in its place? To save some money, couldn't we just use a regular home fridge, and just connect it to an 12volt inverter, and plug it in at the dock? The other thing is, those boat marine refrigerators are so small, that my wife would like me to put in a regular full size one with a big freezer. There must be a reason why, I just don't see it. Maybe someone can explain it. Any information would really help, Thanks Louis S.
Well Louis, I can understand your confusion about marine refrigerators and regular home type fridges. There is no simple answer, yet marine refrigerators can make a substantial difference in regards to performance and power consumption. Yet they do cost more, and generally are smaller in size. If your houseboat has a marine fridge already installed, however it is not functioning properly or needs repair, I would recommend trying to get it serviced or repaired. this means is that there is no difference between operating it at the dock on shore power, or out on the lake and running it off of your house batteries. Also, generally speaking, the marine models used a lower consumption compressor which will pay for itself in longer run times, which means longer anchor times away from the dock. If you don't presently have a fridge on board, and want to try and save some money, you can used a home style fridge, yet you will require a 12v to 120 v inverter to convert your house battery power to your regular 120 v household current needed by the regular refrigerator. In closing, if you're looking for more information on marine models, or where to get one serviced, have a look at these following page. Houseboat marine refrigerators, what kind of fridge to buy, and where to get them serviced? Lastly, hopefully some of our readers will share and post comments about their regular fridge and houseboat refrigerator experiences. Feel free to use the "Click here to post comments." link found near the bottom of this page. Comments for Do houseboats need a marine refrigerator, won't a regular fridge work on house boats? On the Gulf Coast all the work boats use household refrigerators. Not expensive to buy, easy to install. We do however run the gen-set underway. Easy to have all 120 volt everything. I have a Sharpe 18 x 87 foot houseboat. It has 8 Deka 6 volt golf cart batteries wired in parallel to get 12 volts with lots of amps for the 3000 watt inverter. I have a 27 cu ft home type side by side with water and ice through the door. The inverter with this setup will run the fridge and lots of lights. I have 2 state rooms and 2 cuddys, all have TV's and DVD players that operate on the inverter when away from the dock. I was running my genset about 4 hours at night and 4 hours in the morning, used lots of fuel for 20 KW genset. Last spring, I installed 4 250 watt solar panels on my party top. That cut my fuel bill in half as I don't have to run my genset in the morning unless it's a really cloudy morning and even then, they still put in some amps to batteries. I have a 2000 50' Gibson. My fridge went south about 6 years ago, so I bought a house fridge to replace the bad one. I do not have an inverter, so I run the genset when on the water for A/C, TV, etc. I have had zero problems with this full sized fridge & it keeps me supplied in ice. If you will be using your boat around salt-water, you will want to protect your appliances from rust. Marine appliances are manufactured with this in mind. For the guy who's fridge stopped working in the cold,the oil in the compressor gets too cold to pump,thats why it started working when it warmed up. I would buy a house fridge and freeze gallons of water while docked, put them in the fridge while boating, it will hardly turn on. I like the idea of a propane/120/12 volt for long trips. You can find them at junk yards with rv's in them. If your boat is any size at all and you have room, get a generator set. Then you can use your home size fridge and other 110V appliances all you want when away from the dock. If you are cramped for space for a marine Gen., Honda makes a small air cooled unit that is super quiet and has the power to run the fridge plus a couple of fans. Problem with an inverter is that if anchored over night you could wake up to dead batteries. You can run a house type fridge with an inverter on a houseboat but there are many considerations involving the inverter selection and installation. 1. Refrigerators draw an initial surge current when they start that is about 8 time normal running current. It takes about .5 seconds for the current to reduce to normal steady state running value. Your inverter will have to supply the starting or inrush current which means you need an inverter that will supply a surge power of at least 3000W. 2. The inverter will have to be ignition proof in order to mount close to the battery in the engine room. If not ignition proof it will have to mount outside the engine room which will be some distance from the battery. Longer distanced from the battery mean very large and expensive wire from the battery to the inverter. 3. The surge current to the frig also generates a surge current demand from the battery. This surge demand from the battery is about 150 amps. If the inverter is more than a few feet from the battery you will need very large battery wire/cable. If the inverter is outside the engine room you may need 2/0 AWG or larger wire in order to keep the voltage drop at 150 amps to an acceptable level. 2/0 battery cable is about $4.00/ft or more. 4. The internal resistance of a battery is about 5 to 10 milliohm. 5 milliohm is not so bad but 10 milliohm is a problem with a 150 amp surge current. You will probably need two batteries connected in parallel to handle the surge current. 5. To do a proper installation outside of the engine room I think you are looking at at least $600.00 for inverter and wire. You will also need a battery switch. This does not count labor. 6. If you do all this properly it will work but you will be limited to about 10 hours of run time if you use two group 27 size batteries, maybe a little more. If you recharge at 30 amps it will take 5 hours to recharge. 7. An 8 cu ft. marine frig running about 3.2 amps at 12VDC is a much better choice. They are available from Norcold for about $1200.00. It will run 4 times longer than the house fridge. Well Scott, I couldn't have said it any better, and it surely seems like you have done your homework. I have done this installation before for some folks who didn't want to buy a marine fridge, and it ended up costing more than a marine style refrigerator. I was using a smaller house-sized fridge on my 67 Nauti-Line houseboat. I keep my boat at a marina down at the Lake of the Ozarks, and it is constantly powered from the dock. Upon visiting my boat during this past winter, I discovered my fridge was not working. I thought it was dead. I decided to keep it plugged in and wait till morning to see if would miraculously come back to life. It did! I believe that the extreme cold temps caused it to stop working. When the boat got all toasty warm, it worked. I've now replaced it with a Dometic rv fridge which is better made to handle the extreme temps; both hot and cold, that we experience in Missouri. The other fridge made its way back to my home in KC and is working just fine! The truth is most recent houseboats utilize regular home appliances. If you have a generator on board, it's a no brainer as you're probably running the genny for the air conditioning anyways. I'm from the South, and most newer houseboats are equipped with inverters and larger battery banks, and the fridge is usually on that source of power when you're on the water. The fridges available today are much more efficient than those produced even 10 years ago, so the total current requirements are much less. Enjoy. I have been in the same quandary when it comes to deciding on a fridge. I own a 45' pontoon houseboat that I am in the midst of renovating. I plan on buying a standard house fridge. The way I figure is that when I am docked, the shore power will keep it cold, and when on the water the inverter will take over. I don't think it will take much power to keep it cold as the compressor will only come on once in a while to maintain the temperature. I am using a 3000 watt inverter with two deep cycle marine batteries. I have a lot of 12 volt accesories drawing off of these battries also. I will add a third battery if necessary....maybe even a forth? Then I will have to deal with keeping all of those batteries charged. Solar panels? ?....Wind generator? ?....Long extention cord?? Well Ed, when it comes to charging your house battery bank, you will find the following link interesting, it has Tips on Charging Houseboat Batteries, and How to Keep the Battery Bank Charged.